The Infinity USB Smart is a new module based smartcard reader, with a new approach for ensuring a very high level of compatibility and functionality. The core functionality is a phoenix/smartmouse interface, compatible with any Windows, Linux-based system or embedded Linux-based systems like DreamBox, Set-top boxes (STB) or other industrial controller. This is just one of the features of the Infinity USB Smart. The module-based approach makes it possible to install new modules any other smartcard related functionality or standalone operation! The innovative dome-shaped design with upright card insertion, makes one-hand operation possible while keeping a small footprint on the desk. 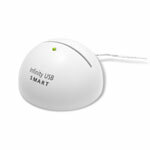 Infinity USB Smart is connected to a PC using a single USB 2.0 connection (backwards compatible with USB 1.1). Since Infinity USB Smart is based on the HID standard, no custom drivers are needed, and installation is as easy as inserting the USB connector. The core functionality of Infinity USB Smart is to provide Phoenix/Smartmouse compatibility through a virtual COMport (VCP). The VCP has been very thoroughly tested with most popular applications and cards. Setting up the VCP is done through the accompanying software, and all popular frequencies (3.58, 3.68 and 6.00MHz) and a boost mode can be selected. VCP modules are available and ready for the Linux operating system, making it possible to use the Infinity USB Smart on both Linux-based PCs, or with embedded systems. Industrial controllers, Set-top Boxes (STB) like DreamBox or any other Linux embedded system with USB host controller can be used. Infinity USB Smart is module based, with separate firmware based modules. This means that the new firmware modules can be installed and downloaded to the hardware when new functionality is needed. Currently modules for use with Linux embedded systems are ready for download, and more will be available later, and on user demand. Installing a module is easy with the Infinity USB Smart software, simply choose a module and press a single button. The modules are complete selfcontained "building blocks", working completely independent from the main-module (VCP). Choosing between the main-module and user installed modules are done with a small switch on the bottom of the Infinity USB Smart hardware. The dome shaped design, with an injection-moulded casing in matte white ABS, will look good on any desk. The smartcard is inserted from the top, making one-hand operation easy, and leaving just a small footprint on the desk. A dual-colour red/green LED indicates the different states of the programmer. PasswordSafe is used for safe and secure password storage and distribution, on standard PIC or AVR based cards. Up to more than 1000 passwords can be stored on a single smartcard, and passwords are easily accessed with a custom shortcut key. PasswordSafe WinLogon can be used for enhancing the Windows logon security, by storing the Windows logon password on a PasswordSafe card..
An overview of all products can be found on the product-matrix.